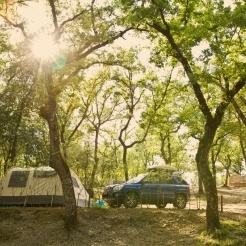 Luxor Chianti Village is a camping situated in the heart of Chianti, in Tuscany. Big and small pitches shaded for a perfect holiday in camper or tent in contact with the nature. The structure welcomes both children and pets and it is provided with all conforts: warm shower, laundromat and hygienic services, restaurant, swimming pool for adults and children, wifi, barbecue and minimarket. The restaurant satisfies all the curiosities about the traditional Tuscany famous kitchen, accompanied by a refined selection of DOP wines among the Sangiovese and the Chianti Classico from the wine cellar of Villa Trasqua, that well approach to the local typical appetizers, to the famous tagliata, to the pici and our home made sweets, among which the famous chocolate cake. Being in the heart in Tuscany guarantees a lot of attractions: Siena, the castles of Monteriggioni and San Gimignano, Etruscan and Romans Archaeological sites and it is excellent for foot or bike excursions. Breath nature and history everywhere!